After he killed his children in a moment of frenzy, Heracles’ punishment was to undertake twelve deeds. One if his last tasks, was to steal the golden apples from the garden of the Hesperides. This was a kind of paradise that surrounded the tree with the golden apples, (a wedding gift from Gaia to Zeus and Hera). When you ate a golden apple you became immortal; so they were much sought after and protected by seven nymphs, called the Hesperides. However Hera did not much trust these beauties and reinforced the team with Ladon, the dragon with a hundred heads. How Heracles managed to get the golden apples, you can read about in Apples from Lesvos. People now wonder what these golden apples were exactly, because many kinds of fruit in ancient times were called apples. More than once, tracing the history of a fruit, I have been amused to read that the fruit was supposed to have hung in the tree in the garden of the Hesperides. Oranges, apricots, quinces, pomegranates and peaches, they are all candidates for the golden apple. Maybe this famous tree was a magical one and bore all different kind of fruit. Although I wonder if it was apricots or peaches that hung in that tree, because historians agree that these fruits originated in China, a country far from the garden of the Hesperides and the Greek Gods. From Persia (from where the name peach comes) Alexander the Great brought the fruit to Greece and later on the Romans distributed it further into Europe. Of course, Alexander did not personally bring the fruit to Greece. He died in 323 BC in Babylon, the mystical city in today’s Iraq, after eleven years of conquering half of the world without ever again seeing his homeland of Macedonia. His conquest of so many countries enabled the mingling of many a Greek tradition with foreign ones and I am sure that neither he nor his soldiers sat down to a Greek dinner, but were served the dishes of the conquered countries. The returning soldiers of Alexander’s army brought home the most strange things, like the seeds for apricot and peach trees. Peaches are a little bigger than apricots, their flesh is white to light yellow; the flesh of apricots is darker yellow or plain orange. Both have a peachy skin, opposed to nectarines, which are peach-like with a smooth skin. These small differences confuse me. In my garden there is an apricot tree producing large apricots, which while ripening change in colour from light green to yellow, then to orange with a fancy bright red blush. My neighbour also has an apricot tree, but hers produces much smaller fruit. 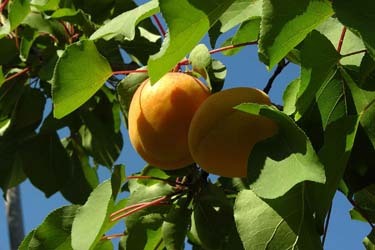 She also has another tree with fruit as large as mine, but the flesh is light yellow, like that of a peach. And there’s another tree with fruit that has orange flesh, which would appear to be apricot, although it tastes more like a peach than like my apricots. Are you still following me? Well, it looks like the apricot-peach-trees here in the neighbourhood each have different fruit. My neighbour also has a tree with fruit, which seems to be a mix of an apple and a pear. It is a very special fruit, also tasting a little odd. I have a pear tree surrounded by only wild apple trees, will my neighbours’ tree be a mix? You could easily believe that the Hesperides have again taken up gardening and are creating crazy fruit, so that future historians will be confused whether we have grown apricot or peach or apple or pear trees. With the prune trees it’s the same story. I have a tree with fruit, which ripens into a dark blue colour and tastes soft and very juicy. My neighbour’s tree produces dark red prunes, which is less juicy and soft. Cherries here also come in two different tastes: the morellos (acid ones) and the sweet cherries, the last nearly impossible to harvest because the birds are always faster than me. But we only have one kind of mulberry: the white ones. So I don’t know what to call the marmalade I have made from the seven kilos of fruit gathered from the various trees: is it an apricot or peach marmalade or should I just call it a marmalade from golden apples? Anyway we are in the midst of the time of the golden fruit: prunes, cherries, apricots, peaches and mulberries all are ripe at the same time. Because of the wet weather in April, I neglected the strawberries a little resulting in a very meagre harvest. When in May I recognized my failing I did my best to pamper them and now they have rewarded me with a second harvest, meaning that whilst picking the fruit from the trees, I also have to roam through the strawberry fields to find the thick red and belated Summer Kings (a Dutch nickname for strawberries). It is hard to get all the ripe fruit, just like it’s hard to catch all the thieving butterflies, wasps and birds who are all feasting upon my fruit and only satisfied after their bellies are well filled. No wonder we have those incredibly huge wasps: they do not produce royal jelly, but apricot and prune jelly (or is it only the bees who make royal jelly?)! Each year it’s a great joy to taste the first ripe fruit from the trees. Even after a second and third day you are still being regaled with them. But when bowls have to be replaced with buckets to collect them, you start to panic about where you will find the time to collect and preserve. Now the harvest is nearly done, and only a few boxes are waiting to be preserved, but I am sure that by next week when I look up at the green but empty branches, I will again be longing for that juicy fruit. Tell me, Hesperides, why can you not make all the fruit ripen at different times?